Teas Etc had its humble beginnings selling tea at Farmers markets, working from a garage and garnering a grassroots following from a loyal customer base. Located in Fernandina Beach, FL., this tea company began its operations in 1998 and through traveling to China in the early days, they forged a commitment to quality and authenticity. At first, Teas Etc sold flavored tea that was sourced from Germany, but they soon learned that flavoring and blending their own teas gave their products a sense of authenticity and integrity, which took a couple of years to master. With a focus on supply chain transparency, Teas Etc developed a network of farmers and producers that soon extended to other tea producing regions. Many of their specialty teas are processed by hand, which honors the craftmanship and skill of their trusted producers. Early mentors encouraged Teas Etc to gain membership in the American Premium Tea institute, now called the Specialty Tea Institute. Mentoring other women in the tea industry is one of the ways Teas Etc gives back to the community. With the development of trending flavors and blends, along with small batches, Tea Etc continue to strive for distinguished offerings of premium quality teas. Honing creativity and focusing on custom products has paved the way for multiple awards and recognition in the tea industry. Teas Etc’s Pear Spice White Organic and Herbal Blend won first place in the North American Tea Championship in 2008. The following year they won first place in Assam and Ceylon Signature categories and second place recognition in Yunnan. Tea Etc’s annual financial contribution to CarbonFund.org encourages customer contributions and they are also involved in the development of a recycling program at their location. Their building was completed with recycled, eco-friendly materials and surplus was donated to Habitat for Humanity. This tea company also works with the disabled and special projects such as local halfway housing and employment initiatives. Tea Etc also supports Shoppe 561 in the fight against the human trafficking. All Teas Etc teas are offered as loose tea in pouches. 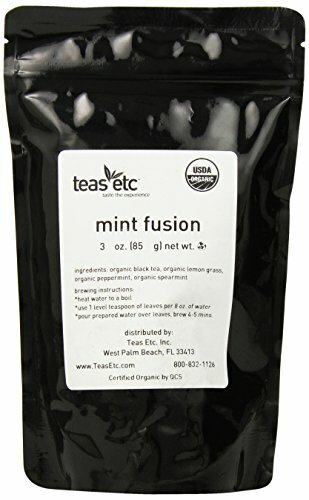 Teas Etc Mint Fusion Organic Loose Leaf Black Tea 3 oz. With a fusion of USDA Certified Organic black tea, lemongrass, spearmint and peppermint, this refreshing tea hails from Nilgiri, India and is also Certified Kosher. Custom blended and flavored in-house, Mint Fusion comes in a sleek, foil-lined pouch to preserve freshness. This naturally sweet tea has a balance of soothing and uplifting qualities, with bright, minty notes, a hint of lemon and a smooth finish. Delicious hot or cold, this tea is not overly minty and is enhanced with the addition of honey and lemon, or if you prefer, a sweetener of your choice. One level teaspoon per 8-12 ounces of hot water and steeped for 5 minutes should suffice. 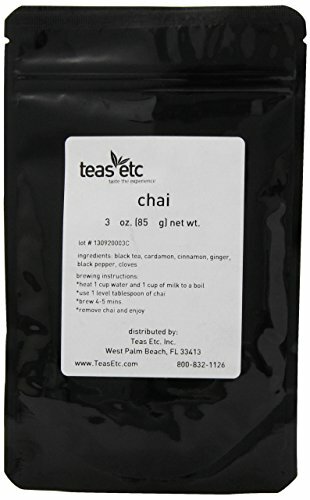 Teas Etc Chai Loose Leaf Black Tea 3 oz. You’ve come to the right place if you’re looking for a traditional chai, with a blend of organic black tea, cardamom, cinnamon, ginger, black pepper and cloves for a spicy treat. Enjoy brisk flavors when you sip this richly aromatic blend. This well-balanced chai tea doesn’t burn like some others on the market and probably won’t need any enhancements. Special instructions for brewing this chai involve slowly heating one cup of water and one cup of milk to just boiling, to which ¾ of a teaspoon of chai tea is to be added and left to steep for 5 minutes. Strain and enjoy. Teas Etc Spring Green Organic Loose Leaf Green Tea 16 oz. 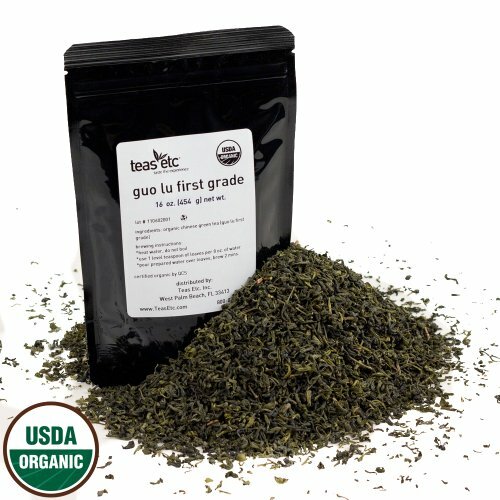 Sourced from Anhui Province in China, this pure and simple green tea is USDA Certified Organic. With a light flavor and delicate, vegetal quality, this tea is gently sweet and never bitter. A cup with a lingering aftertaste that is pleasant and clean, Tea Etc has crafted a product that can be enjoyed any time. Use hot, not boiling water and place a heaped teaspoon of this green tea per 8 – 12 ounces of water. Steep for 3 minutes, strain and drink straight or with your choice of sweetener. Tea Etc is a simple company that produces complex blends as well as straight forward brews. Along with their pretty tea travelers, which are great for drinking quality tea on the go, their teas are definitely worth getting into.